Measles is a major cause of childhood mortality in developing countries which is mainly attributed to the ability of measles virus (MV) to suppress general immune responses. Paradoxically, virus-specific immunity is efficiently induced, which leads to viral clearance from the host and confers long-lasting protection against reinfection. 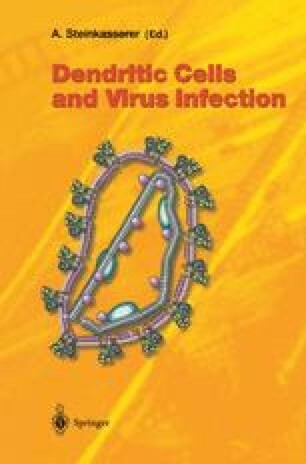 As sensitisers of pathogen encounter and instructors of the adaptive immune response, dendritic cells (DCs) may play a decisive role in the induction and quality of the MV-specific immune activation. The ability of MV wild-type strains in particular to infect DCs in vitro is clearly established, and the receptor binding haemagglutinin protein of these viruses essentially determines this particular tropism. DC maturation as induced early after MV infection is likely to be of crucial importance for the induction of MV-specific immunity. DCs may, however, be instrumental in MV-induced immunosuppression. (1) T cell depletion could be brought about by DC-T cell fusion or TRAIL-mediated induction of apoptosis. (2) Inhibition of stimulated IL-12 production from MV-infected DCs might affect T cell responses in qualitative terms in favouring Th2 and suppressing Th1 responses. (3) The viral glycoprotein complex expressed at high levels on infected DCs late in infection is able to directly inhibit T cell proliferation by surface contact-dependent negative signalling. This most likely accounts for the failure of infected DC cultures to stimulate allogeneic and inhibit mitogen-stimulated T cell proliferation in vitro and the pronounced proliferative unresponsiveness of T cell ex vivo to polyclonal and antigen-specific stimulation which is a central finding of MV-induced immunosuppression.